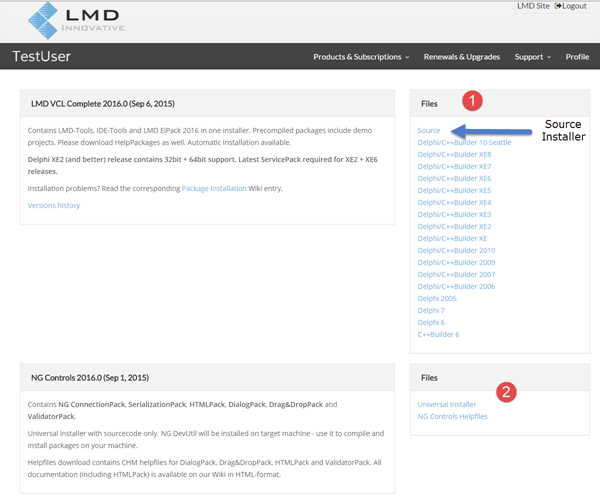 With LMD/NG 2016 releases we introduced a new redesigned customer area where purchased products, support options and discounts can be accessed. Instead of login data for each purchased product only one account per user is issued. Thus only one customer login is required to access all purchased products (LMD/NG 2016 and higher). 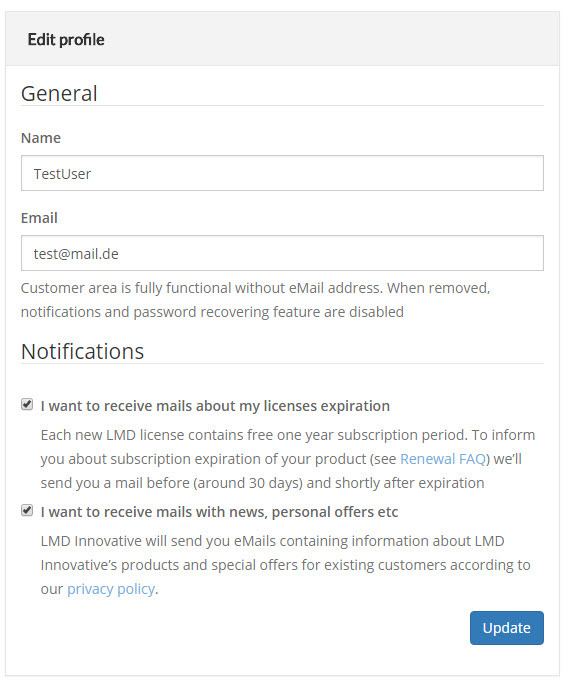 Expiration date of subscriptions can be reviewed and renewals / updates can be ordered directly from user area. Special discounts are automatically applied! New customer profiles exist. Except customer id (the login name) all other customer data (eMail, password etc.) can now be changed by the user. Profiles can also be used to opt in/out for customer eMails like new version notifications or special discounts. In main section overview of all registered products can be seen. You can reach download area of a specific product via the Products&Subscription menu, by clicking on a product name or the blue download button besides the product box. To download license data (regutil + license file) click on the link below the Seria# header. A zip with license file (LMD*.lic) and regutility (lmdutil.exe) is generated then. This is a great improvement against old user area, because you can now generate license files at any time without contacting support (e.g. when you misplaced them and you need to install to a new system). Unlike in previous release LMD RegUtility is needed only to test installed licenses. Because username/password are now setup via your web user profile, no automatic connect to new customer area is possible. Create the folder(s) manually and copy the license file (*.lic) into it. In this example %APPDATA% system variable points to the C:\Dokumente und Einstellungen\Username\Anwendungsdaten directory. Use the Reg Utility (lmdutil.exe) to validate whether license file is correctly installed. Alternatively the license file can be copied to the System directory (e.g. C:\Windows\SysWOW64 on 64bit systems, C:\Windows\System32 on 32bit Windows XP etc.). If you own a license with SVN support, access data can be reviewed here. Since LMD/NG 2018 release SVN support was replaced by LMD Git server. Read Git access readme for more information. 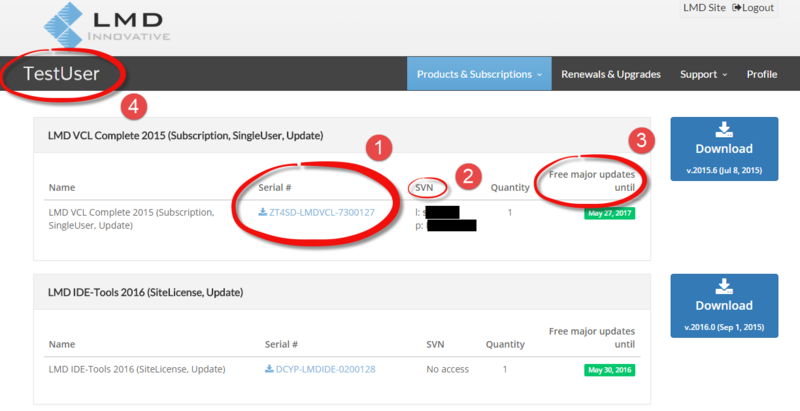 Please note: Git access is available only for LMD or NG Complete customers. All new licenses (from 2016 on) include now free one-year subscription. Subscription period refers to the right to receive free new new major updates: If a new major version is released within subscription period, you'll receive automatically new version free of charge. Subscriptions refer only to the right receiving free major version updates. If your subscription expires, your licenses behaves like before (free minor updates until next major release, perpetual use of the current license). This link displays your username. If you click on it, the main page with license (as shown in the screenshot above) is shown. Please note that you can change your username (e.g. to anonymize your name/company) in the profile settings. All our products always include full source code. 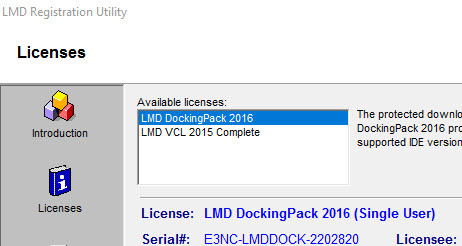 Compiled versions of LMD VCL installers do not include source code, though. To retrieve source code, please download the separate source installer. NG Controls installer represents an universal installer. This installer always contains sourcecode which is compiled on your machine with the NG DevUtil utility. Screenshot above represents new profile settings which represent at least all personal data which is stored on our severs. Except the userid you can change any user specific data. Password can be changed as well (Point 1). If you forgot your password/userdata, you can reset password via login screen (you need to mention either username or current stored eMail address). EMail field can be empty. However notifications and password recovering feature is disabled then. License expiration notifications are bound to a specific license (mails are automatically sent out shortly before and after your license is about to expire). Apart from that you won't receive any mails via this list. The second notification type covers news about LMD Innovative products, releases or special offers for you. For new users both options are switched off. After enabling a notfication you can disable it again at any time using your profile page or use the unsubscribe link in the eMail. This page was last modified on 21 September 2018, at 00:29.